We have all experienced it…you say something to your dog and he tilts his head to look at you with those adorable eyes, but what does it mean? They are trying to get an emotional response from you- many dogs have been taught that you smile every time they tilt their head and they are just trying to make you happy. Tilting their head allows them to pinpoint the location of the sound better. 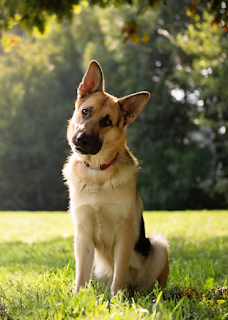 Researchers have found that, depending on the shape of the dog’s head, tilting may have some physical or sensory benefit. It is not clear why, but seems to be especially true in dogs with longer muzzles. Deep concentration-It has been found that when dogs are extremely focused on the meaning of your words they tilt their head, perhaps listening and watching for social cues. *Please note- Sudden, ongoing tilting of the head can also be a sign of a medical problem. Dogs may tilt their head when they have an ear infection or a foreign object in their ear.